This award recognizes a Florida State University College of Law graduate who has dedicated their career to public service and who has demonstrated exceptional character, integrity, humility and professionalism, as well as the highest regard for ethics. 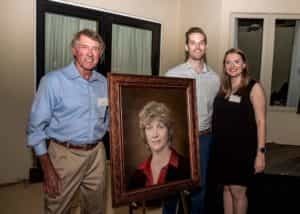 Kris Knab served 22 years as the executive director at Legal Services of North Florida, Inc. (LSNF), before retiring in 2016. She was selected for the award out of 49 nominees. Her nominators called Knab a “champion for the underprivileged,” and submitted evidence of her skillful leadership of LSNF, especially during times of limited resources. Knab passed away in 2018 and will be posthumously honored. An oil portrait of Knab will also be displayed prominently at the law school.